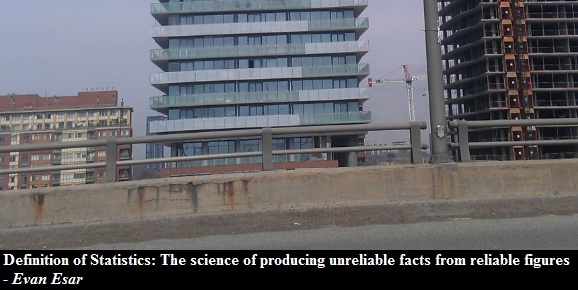 There is a systematic error in the way TREB reports home sales each month. Every month Toronto's real estate cartel calculates the headline sales number by comparing "original" (first published) number to a revised sales number from a year before. The original home sales number, or the one which is published for the first time, overestimates the volume of home sales in the GTA by over 200 sales on average each month. 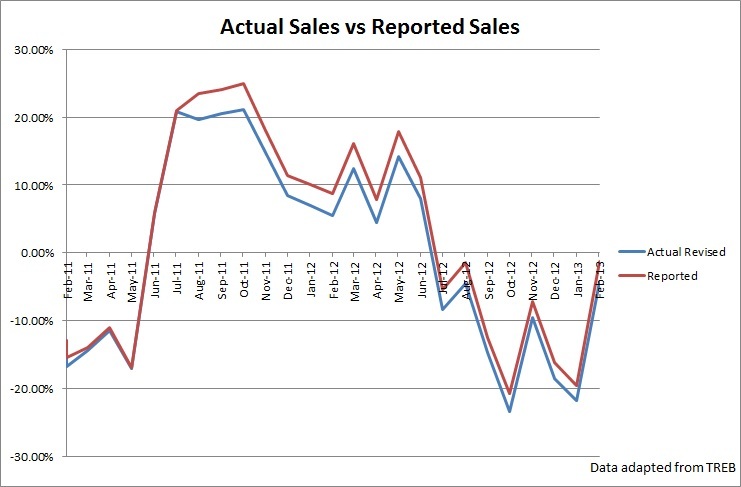 Consequently, the revised home sales stats are always lower than the originally reported numbers. So when you compare original home sales stats to revised home sales you automatically overestimate the home sales that had occurred by two to four percent. In January 2013, TREB originally reported that there were 4375 sales in the GTA, a decrease of -1.3% from January 2012. In this case, TREB compared "original" home sales number of 4375 sales in January 2013, to a revised number of 4432 sales in January 2012. This way the headline number appears to be a decline of -1.3%. As of March 2013, the revised number of 2013 Januaries home sales in the GTA is 4247 (scroll to last page to see it). In other words, while originally TREB reported that sales were down by only -1.3% in January 2013, in reality the home sales were down -4.2%. In fact, TREB has been over estimating the sales volume since July 2011. In July 2011, TREB introduced a new design for their Market Watch report, and started revising their data. Only since then has the overestimation of sales occurred. Original - the headline sales number that is published every month. Revised - the number that is published a few months down the road on the last page of the report. Original - Revised = the difference between original home sales number and revised number. Reported - the headline number that is reported each month by TREB - also, the number that is being picked up by mass media every month. Actual Revised - the actual sales volume change for a given month when you compare revised stats. 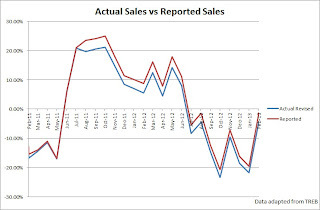 Original - sales volume change if you compare the original numbers. What is interesting is that before July 2011, TREB's reported headline sales numbers were almost the same as the revised stats. I suspect this is the case because TREB compared the "original" (first published number) for a given month to the "original" number from a year ago. Once TREB started comparing an "original" number to a "revised" number of sales, the overestimation started to occur. 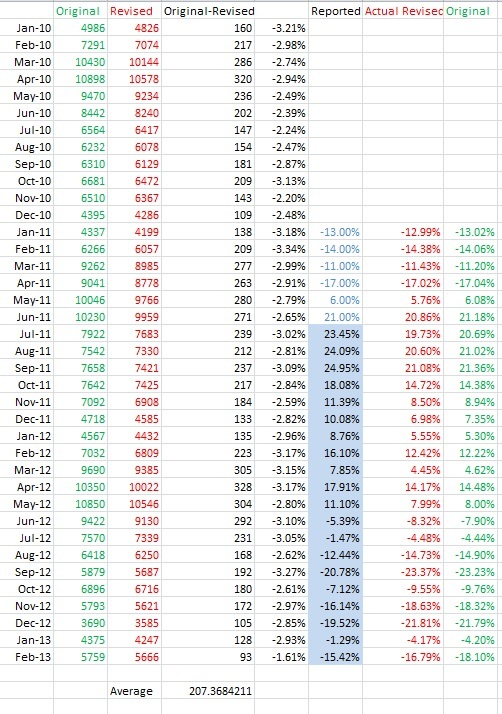 If you look at the spreadsheet above, you can see that when you compare "original" (green) sales stats, they produce much more accurate representation of a market than when you compare "original" number to a "revised" number. If someone from TREB is reading this, I think you should go back to comparing "original" sales numbers when you make a yearly percent change comparison as it is way more accurate.